Smart dominates in terms of 4G download speed, overall download speed, 4G latency, and 3G latency. Mobile analytics firm OpenSignal has recognized PLDT wireless unit Smart Communications, Inc. for having the country’s fastest LTE network, bestowing the company four citations including best in 4G LTE download speed; best in overall download speed; best 4G latency performance; and best 3G latency performance in its March 2018 report. The OpenSignal State of Mobile Networks: Philippines report, which covers the months of November 2017 to January 2018, noted Smart LTE speeds outpaced its competition’s with download speeds of 12.5MBps – significantly faster than its rival’s 7.69MBps. “With tested speeds of 12.5 Mbps, Smart won the OpenSignal award for 4G download speeds, making it the third time it has done so. The operator is pulling away from its sole competitor in this category,” OpenSignal noted in its report. “As their trusted digital partner, we understand how speed makes a huge difference in the life of our customers, whether it’s for their increasingly mobile careers and businesses or for their entertainment needs,” said Eric R. Alberto, PLDT Group Chief Revenue Officer. “These OpenSignal citations are proof that we are making great strides toward our goal of giving Filipinos a world-class mobile internet experience that keeps up with their fast-paced lifestyle. Mobile Analytics firm OpenSignal awards PLDT wireless unit Smart Communications, Inc. for dominating in four metrics, including 4G LTE download speed; overall download speed; 4G latency performance; and 3G latency performance, in its latest State of Mobile Network: Philippines report. 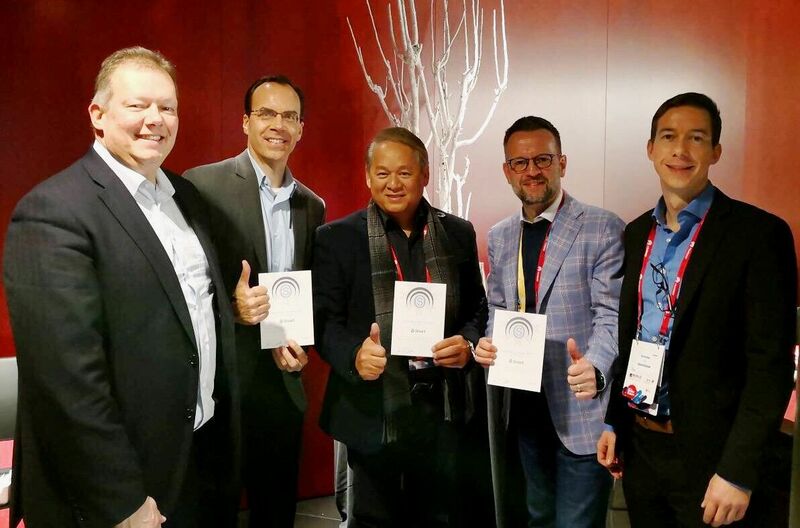 In the photo are: (from left) Andy Burns, OpenSignal Chief Operating Officer; Ralph Brunner, PLDT and Smart Chief Customer Experience and Data Analytics Advisor; Eric R. Alberto, PLDT Group Chief Revenue Officer; Joachim Horn, PLDT and Smart Chief Technology and Information Advisor; and Brendan Gil, OpenSignal Chief Executive Officer. The latest OpenSignal report found Smart LTE speeds superior across all measured areas, such as in the National Capital Region (13.04 Mbps vs competition’s 8.57 Mbps), North Central Luzon (11.59 Mbps vs 6.34 Mbps), South Luzon (11.66 Mbps vs 7.03 Mbps), Visayas (13.49 Mbps vs 7.37 Mbps), and Mindanao (14.42 Mbps vs 7.38 Mbps). To put things into perspective, top streaming apps like iflix and Netflix recommend download speeds of at least 5Mbps for watching on High-Definition or HD resolution seamlessly – way within the performance of Smart LTE. Moreover, a 2017 OpenSignal blog post also noted that top mobile games like Clash Royale, Critical Ops, Mobile Legends, and Super Mario Run require download speeds of at least 2Mbps for an awesome gaming experience. After taking into consideration both its 4G and 3G download performance, OpenSignal also cited Smart for best overall download speed average in the country at 5.8Mbps versus competition’s 4.4Mbps. The firm also evaluated the network’s latency, or the amount of time a data is exchanged through the network, determining its responsiveness. Measured in milliseconds (ms), a lower latency score is a sign of a more responsive network, which is critical for lag-free mobile gaming. Smart came ahead in 4G latency, rating at 47.21ms, quicker than the competition’s 60.7ms. The abovementioned 2017 OpenSignal blog post noted that a maximum latency of 50ms is required for an ‘awesome experience’ in playing top mobile games like Clash Royale, Critical Ops, Mobile Legends, and Super Mario Run. On the other hand, Smart’s 3G latency also fared better at 154.64ms, compared to its rival’s 174.98ms. Smart is ramping up its LTE roll-out across the country, and is accelerating the deployment of LTE-Advanced (LTE-A) to deliver bigger bandwidth and much faster data speeds to mobile phone users. “With our ongoing roll-out of LTE and LTE-Advanced to more areas, we are on track to meet our commitment to the National Telecommunications Commission to achieve 90% municipality coverage for 3G and 4G mobile broadband by the end of this year,” said Mario G. Tamayo, PLDT and Smart Senior Vice President for Network Planning and Engineering. Along with its network upgrades all over the country, Smart continues to inform and encourage customers to take full advantage of the improved Smart LTE network across the country by: 1.) upgrading to an LTE-capable smartphone; and 2.) switching to a Smart LTE SIM. Smart Prepaid and Smart Postpaid customers can check if their existing smartphone SIM is LTE-ready by texting SIMCHECK to 5832 for free. Smart, TNT and Sun customers can also easily upgrade to an LTE SIM without changing their existing number by availing of an LTE-Ready Self-Service Upgrade SIM for only Php10 at Smart loading partners nationwide, such as sari-sari stores, kiosks, and shops. As a perk, the LTE-Ready Self-Service Upgrade SIM comes with Free 1GB data valid for three days upon upgrading.